Here is a set of 6 mugs. 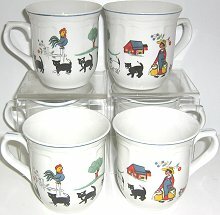 The design is called Farm Friends and it features a milkmaid followed by 6 cats. Design wraps around the mug. Each mug is 3 1/2" high x 3 1/4" wide, not including the handle. These are stoneware mugs by Oneida. Previously owned but in excellent condition - no stains, chips or cracks.